Miami University Summer Theatre was born fifty years ago this summer as a joint venture of the Miami and Oxford communities. 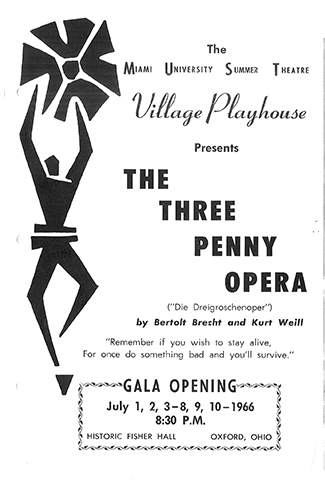 Under the leadership of Donald L. Rosenberg, professor emeritus of theatre, the first season featured a musical, a murder mystery, a classic comedy, and a children’s show. The first summer proved such a success that nearly forty seasons followed. Members of the MUST+50 Facebook group have shared personal remembrances, programs, and photos spanning the last five decades. The Department of Theatre has also created a webpage to document the history of the Miami University Summer Theatre. Were you or someone you know involved with MUST? Be sure to join and submit your memories and photos to the MUST+50 Facebook page.